School spending on instructional materials and construction has risen over the past year, as public funding for K-12 continues to creep upward from the darkness of the Great Recession, a new analysis finds. The newly released 2015 Annual State of the Educational Marketplace report draws from different organizations and sources of data, and was published by the Education Market Association, a Silver Spring, Md.-based trade organization. The report can be purchased online, but the association gave Education Week permission to excerpt the data here. One of the big takeaways from the report is that total K-12 spending for instructional materials rose by 9 percent over last year, to $11.8 billion in the 2013-14 school year. That marks the first increase in instructional materials spending since the the 2007-08 year. Yet while the overall climate for buying has improved, a little perspective is in order—spending on those items has still not returned to levels before the Great Recession, which officially ended in mid-2009, the report points out. The authors define instructional materials as textbooks, supplies, materials purchased for school libraries, educational media, and software—but not technological hardware. The data were compiled by MDR, a market research firm. Another area of increased spending in K-12 isn’t tied to what’s going on inside classrooms—but rather to the school buildings themselves. More than $14 billion was spent on school construction during 2014, an increase of 5 percent over the previous year, the report found. It’s the fourth straight year that spending on school construction has risen. Nearly 55 percent of that spending, or $7.8 billion, went into new construction, and the remainder went to additions to existing buildings, retrofitting, and related work. Spending varied by region. The area that included Texas, Louisiana, Oklahoma, and Arkansas is booming, and has the highest spending of any in the country, putting $2.2 billion toward school construction of one kind or another. Only one region, the one that includes Illinois, Minnesota, and Wisconsin, spent less than $800 million on school construction, and even in that case, school districts in those states reported spending more in 2014 than the previous year. The data on school construction are drawn from School Planning & Management’s 20th Annual School Construction Report, and it covers activity in 2014, as well as activity that has begun in 2015. 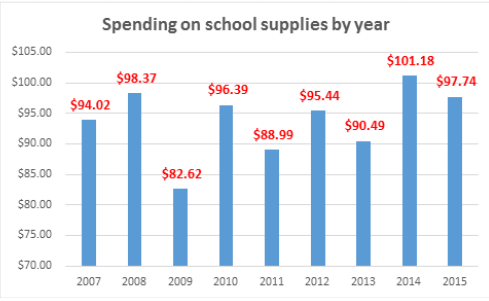 The report also breaks down spending on school supplies. The average family this year will spend $97.74 on those items. That’s down slightly from about $101 per year, according to the National Retail Federation. (See the year-by-year breakdown, below). When parents cut back on back on school supplies this year, it’s probably safe to expect a rebound next year, as families that scrimped and saved try to replenish, the federation explains. Overall, when apparel, supplies, and electronics are included, the average family will spend about $630, the federation says. And total spending on school supplies will be about $3.9 billion. The construction spending in Louisiana is Exclusively a product of the $3 billion FEMA money from Hurricane Katrina being spent to build or rebuild new schools in New Orleans. The rest of the state schools are financed via local property taxes leaving too many rural communities without sufficient funds. Our homestead exemption of $75,000 cuts into those tax collections. Our state education funding mechanism is a disaster especially now that our unqualified reformee State Superintendent is whole hog privatization and diverts millions to charters and unqualified Teach For America instructors. Sean — The $1.3 billion for instructional assessment materials you reported recently really should be part of the $11.8 billion for instructional materials, perhaps increasing it to upwards of $13 billion. And your reported increase in instructional assessment materials may well in part be a shift within the instructional materials bucket from paper-based materials to electronic-based materials that include instructional assessment components. It’s not easy to keep the instructional materials and overall assessment buckets separate to provide a clear picture of what is happening to each bucket. Doug — I’m inclined to agree with you on this point. Much of what gets branded or classified "assessment" today fall in the category of instructional materials and resources. Not in WA. All the increase in money for material and supplies last year, about $125 more per student per year, was spent on staff salaries. The state is set to increase funding for material and supplies again by about $400/student/year by 2016 and not a dime will go for student supplies. It has been claimed by teachers. There is no balance. However much teachers deserve a raise, however much staff wants more social workers, students deserve more funding. WA students do not have field trips, elementary social studies, or art, much less new curricula. Science supplies are meager. The teachers and the administrators have representation at the negotiation table, the students have no one representing them. Adults get all the money.